Mille Kalsmose inside her work "Cosmic Family"
At times, you come across an exhibition so universel in its character that it seems to exist above time and place, and yet, at the same time it gives the impression that it is directed right at you as an individual in a specific moment in time. 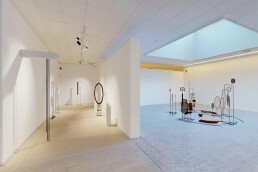 Mille Kalsmose’s “The Shape of Us”, which is currently on view at Horsens Art Museum, is such an exhibition. As a portal into a new dimension of consciousness, the exhibition is an exploration of how we are shaped as humans, not in a literal way, but rather through the vibrational interplay between particles, affecting how we interact with and perceive the world – society, nature, ourselves. We met with the Danish artist for a conversation about the exhibition and the search for new layers of consciousness in a world that is constantly shapeshifting. Congratulations on your new exhibition The Shape of Us, which takes place at Horsens Kunstmuseum from 3 November 2018 – 20 January 2019. Can you give us some insights into your thoughts and ideas behind the exhibition? Thank you. After working in New York for some years, it is interesting to be back home in Denmark to present a solo show, where I for the first time have been given the chance to put my large scale works into a continuation, each of which serves in the unraveling of each other. 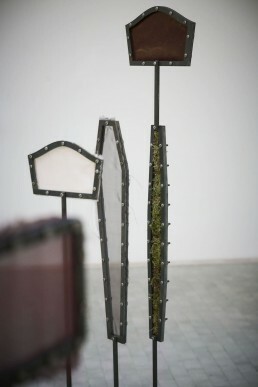 The show consists of five iron installations – the first work is titled “Made in Time” and functions as a kind of portal to another dimension with a different temporality or a “rite of passage” that somehow not only opens the show, but also unveils the rest of the exhibition. 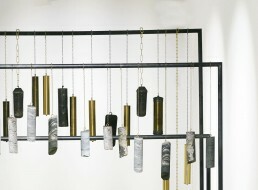 The main part of the installation “Made in Time” is an iron structure to which different elements are attached, like pendulums from antique clocks as well as pendulum-imitating iron ore rocks linked to the metal skeleton with brass and iron chains. The iron ore rocks are marked by biochemical evolution and erosion – irreversibly imprinted by time. They are materials created a long time before the origin of humanity and that perhaps will keep existing long after our extinction. The natural gleam of the iron matter is nearly impossible to sustain; the sparkling shine makes the matter more vivid and in ways adding grace to the heavy substance. 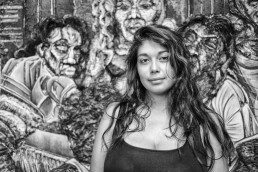 The work is bringing awareness to the matter, but only to let the viewer see it as more than its mere palpable qualities. It gives entrance to a world that is hidden from those who dwell in an ordinary, structured reality. Notions of time, time-measuring and levels and our consciousness too are questioned, even suggested reversed. To me, the show is unfolding like a journey into new layers of consciousness and after having passed through the first gate and let go of conventional thinking and dualistic perceptions, you are walking into the second work in the exhibition “Re-Programmed Relations”. It is a sculpture group that engage with the architectural, spiritual and social realms through a mixture of organic, industrial, found untraditional elements that are connected in a network of objects, all linked in time and place, like an enhancement to gain access to another syntax in understanding how we are. It is objects that in some way appear familiar to us, as something that fills our everyday life without completely doing so. The figures play with the absence of hierarchies between man, things and physicality as well as their internal connectedness, from animated objects to the objectification of man with references to society’s involvement in the overall presence of social media and other new-technologies and especially its focus on “surface”. Already while standing among the sculptural group of plaster and steel, you can hear the sound from the installation “Vibrant Matter” in the next room. The sound is like a chanting tune, and it was developed together with neuroscientist Peter Michael Nielsen and psychologist Alex Ashot Ikilikian. 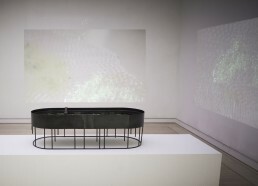 This very soundtrack has been proven to hold healing powers to cure depression, and in the exhibition the sound is streaming out from a metal construction containing water and algae. It is interesting to see how invisible sound waves materialize; one can clearly see waves in water and movement in the algae stimulated by sound vibrations. 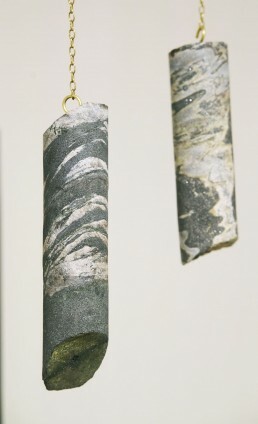 The show comes to an end with the iron and silk installation “Cosmic Family” where sounds from Saturn’s rings (recorded by a NASA lab) are played alongside with installed meteorites, moss, leather, iron and silk arranged in carefully curated circular formations – resembling and interconnected with each other. 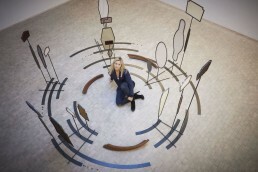 The visual structure of the work is about circles, but the work itself addresses cycles and resonances; the mirroring of the macro-cosmic in the micro-cosmic. Cosmic Family is very much about interconnectedness and the ever-present and constantly moving and evolving dependencies and relations. For years now, I have been exploring and challenging how we perceive relations. I do not see relations only as occurring between ourselves and other people though. It is also about what kind of relation(ship)s we have and continuously are building to ourselves; to a high degree it’s about identity shaping – a topic which is still the main tread of the show. In the process of making the exhibition, you have been collaborating with a psychologist and a neuroscientist. How did they contribute to your practice, and what was your experience of working with a scientific approach in your creative process? I studied Bioart in (SVA) School of Visual Arts and I am still fascinated with crossovers of various research fields. Working with neuroscientist Peter Michael Nielsen and psychologist and soundhealer Alex Ashot Ikilikian was very interesting; together we were examining the healing properties of sound, and we managed to develop a soundtrack that can be used in treatments for mentally suffering patients. A few hospitals have already started implementing this method, but most stick to the traditional electroshock and belt fixation. In nature religions, art, religion and medicine have always been interwoven so I hope to be able to continue this research. Can you elaborate a bit on the title The Shape of Us? This is a bit of a wordplay, actually, since I do not believe in firm shapes, and also the exhibition highly emphasizes immaterial elements like time, translucency and consciousness. I believe that everything is made of vibrations; of never stable, constantly vibrating particles. But “shaping” also refers to the inner shaping – of our identities, the relation to ourselves and to others that give us the “shape we have” – our identity. The work “Cosmic Family” elaborates on these inter-human connections, as a viral network, and plays with the way that the macro-cosmic is mirrored in the micro-cosmic elements as well as with the relation between the particles in the whole universe. I believe in resonances on the different plans; like human body cells essentially having the same ground structure as cosmic dust! 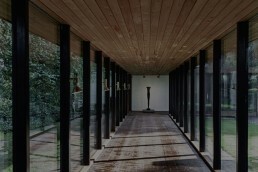 You make use of different materials, spanning from iron and wood to silk and plaster. What were your thoughts about the materials and the way the different forms of material influence each other and constitute the overall shape of the exhibition? To me, bringing an intense focus to a palpable matter and its mere inherent qualities gives me access to a presence where I’m non-judgmental and freed from having fixed ideas of this and that, it’s like an accesspoint for my senses to rule and move me towards a world beyond the mere materiality as we have learned to perceive it. I think that is why I like experimenting with various objects; bringing them together unprocessed, creating a new order using well-known elements. I like working with found objects as they already carry a history animated and inherent within them, like in the work “Re-Programmed Relations” where a group of different elements encloses the viewer. 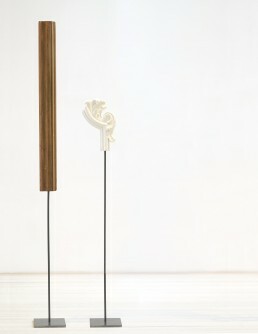 In some works, the choice of main / carrying element is crucial, like iron in “Conscious Matter”, because of its cultural, conceptual and mythological significance, as in alchemy iron is believed to be related to the human self-insight, which refers back to the overall topic of the exhibition. I also merge the different items and materials with non-materialistic elements like sound, working with the fluidity of matter that surrounds us. Your work often raises existential questions about human identity and our navigation through life – how we are shaped through our interactions with each other and the outside world. How would you like the visitors to engage with the exhibition, and what do you hope they will take away from it? I hope that the works, and the way they are organized: in the different rooms starting in a passage, can give the visitors an access point to the present and perhaps even a notion on their own self constructed truths about the world that we live in. Speaking from my own experience; I used to think that the big narratives were dead, and to a certain degree they are. But behind them I’m searching for the pillars that human nature is build upon and it seems to me, the closer I look, that there is a kind of path towards a set of pillars and for some reason I just can’t help keeping digging into that. The relationship between the subject and the object is an ongoing theme in your work. Can you tell us about your exploration of this interweaving of the individual and the object? To me, things are not black and white or divided into dichotomies like between subject/object, inner/outer, human being/nature. I think it has been a filter to perceive the world for many years, but I do not think they apply in our fluent society any more. It is all woven together; we are all woven together not only with other human beings, but also with objects and immaterial essences. “Re-Programmed Relations” is very much about that. The figures play with the absence of hierarchies between man, things and physicality as well as their internal connectedness. They appear familiar, as something that fills our everyday life without completely doing so. 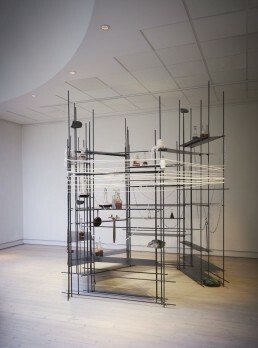 They engage with the architectural, spiritual and social realms through a mixture of organic, industrial, found and untraditional elements that are connected in a network of objects, all linked in time and place. To me, they are animated objects that are more 2- than 3-dimensional and have a pretty surface without focus on content and with a clear untouched backside. This resembles the direction of humanity as it appears in western cultures today as we more than ever are bringing an objectification of ourselves into play. That is what happens with the overall presence of social media and other new-technologies and especially their focus on surface instead of content. Take the “selfie” culture where we with duckfaces make ourselves comparable like sellable objects, yet we are aiming for the opposite and trying to convince and prove our existence, but still only appearing on screens of our devices, with no close connection to real humans and with each and every “selfie” uploaded to a vastness of the world wide web. You are living part time in New York, part time in Copenhagen. How do you think the dynamic of these two cities affects your artistic practice and shapes you as a human? I think being an established artist, it was always important to have a kind of mobile lifestyle in order to be open-minded and receptive to other ways. And of course, as an artist, being in New York of all cities, gives me very different perspectives on how you build your life and career. Everything is in a much bigger scale, and things happen at much higher pace. Also, most influencers in the art world visit New York at least once a year. These are the people my artworks are exposed to which, of course, is a great advantage and privilege. It does require being in two places at the same time, but you simply learn to work harder. Denmark, on the other hand, is a place of stability and some kind of safety with national support for professional artists, like my recent studio residency at The Danish Art Workshops (Statens Værksteder for Kunst) and the working grant for investigating in art (not bound up on a specific project) granted by The Danish Arts Fund. This atmosphere somehow creates a platform for doing more artworks that are rooted in research and not market terms which I of course believe that art should be in the first place. 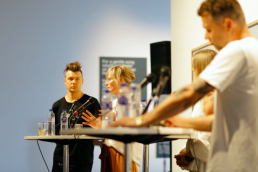 I think this net gives us, Danish artists, an advantage in terms of creating good, meaningful artworks, but some of this energy gets lost too, since we don’t have many big private funds and collectors in Denmark (as you see in other countries) that could back up the artists internationally. I believe we could go much further if big foundations and sponsors started focusing on the artists the way they work and support institutions and museums. We are living in turbulent times. The shape of our collective identity seems to be constantly changing along with a new political and media landscape that influences the individual in many different ways. Do you think it makes sense to talk about a collective identity at all, a ‘shape of us’? And which role does art play in that matter, in your eyes? I love the question, and yes I very much believe in a collective identity, even though we are also witnessing a movement towards us being more self-referential than ever. I started working more directly with this kind of notion with my “Tribe” work that was recently shown in ARoS (Aarhus Museum of Art) and kept diving deeper into this subject with “Cosmic Family” and “Re-Programmed Relations“ – both works are currently on view in Horsens Kunstmuseum. It was crucial to me to work with objects that were somehow “animated” and have had a life before coming into my hands – a bit like a wooden totem – which, as I learned quite early during my time in New York, was not comme il faut to work with as a non-native American. Still, I carried on, and the sculptural installation “Tribe” came out of it. The work developed into more variations and later into “Cosmic Family”. I think this epoch we are living in is all about us understanding ourselves as a Tribe again, not as it used to be with a shaman that everybody followed and were told their destiny in life by, but rather getting back to understanding that we are rooted together in one big family that is connected, but as individuals who must form our own truths, not the ones of others. "Everything is more of a negotiation now in this new fluent modernity, where everything is in a constant change, even our intimate relations - nothing is fixed, not even our own identity"
Sociologist Emilia Van Hauen (whom I also work with), says it brilliantly when she says that; “Neo-Tribal Networks build on trust to the project rather than survival as we have navigated and structured our relations around for decades.” With bound communities build around hierarchies, fixed sets of rules and commandments were very practical if you had to survive as a bigger group. These structures were at the same time limitations to how much the individual or a society could develop. “For the very same reason the bound communities are also very excluding: if you do not fit in and do not do as you are expected to, you will not be granted permission to come in. And if you rebel against what are already a part of, you risk punishment or exclusion,” says Van Hauen. She mentions the military as an example of modern-day, highly functioning bound community “where there are clear commandoes and an obvious hierarchy, that simultaneously upholds fixed rules for who is supposed to do what and at what times”. So today where we no longer live in pre-modern times with its familiar traditions and known rituals in communities which create a notion of a safe environment, we need new rituals and new ways of feeling safe. Everything is more of a negotiation now in this new fluent modernity, where everything is in a constant change, even our intimate relations – nothing is fixed, not even our own identity. We need an ontological safety where we rather feel than knows that you are home. In many non-Western societies, art, religion and medicine have been regarded as one single activity, which corresponds with the way I see the world too. This connection between the fields gives rise to various rituals, as an individual must in a way prove their worth to become part of a community. Rituals consisting of separation, liminal and the incorporation phase let the individual evolve, become a new, maybe better version of themselves. The French anthropologist Arnold van Gennep points out the liminal phase as the most crucial one where individuals finds themselves in an absolute void. This only highlights the fact that the pre-known and pre-assumed sets of rules, traditions and even laws must be abandoned in order to enter a transformation. A true metamorphosis cannot occur if we carry old burdens and walk down the already pathed ways. I hope with this show to point towards these notions or open for a peak hole into this new order with new tools. Click on the image below to see the exhibition “The Shape of Us” in 3D. How Well Do You Know The Current Danish Art Scene?